This is a totally vegan recipe and serves approximately 4. Did you know that a cucumber contains 96% water? 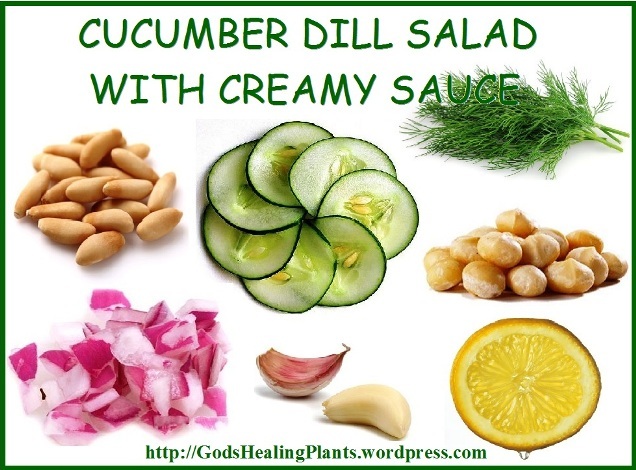 This makes cucumber not only an excellent hydrator, but it’s also great for removing toxins from your body. 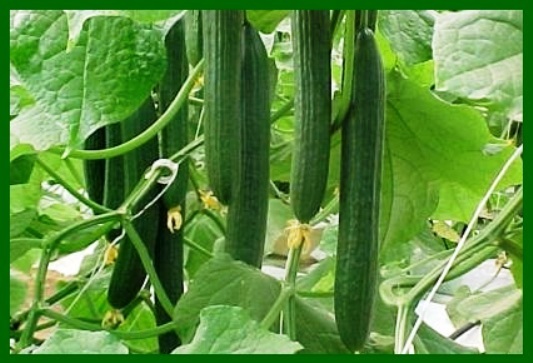 On top of that, it is loaded with Vitamins A, B and C and studies have proven that cucumbers have potential to fight cancer, high cholesterol and high blood pressure. Macadamia nuts contain minerals such as calcium, iron, phosphorus, magnesium, potassium and selenium which is a natural antioxidant that helps to prevent certain types of cancer, and vitamins such as vitamin A, E, and the group B, as B1, B2, B3 and B9. These nuts are cholesterol-free and are a great source of fiber; they have a high fat content, since almost 80% is monounsaturated fat, a type of good fat which helps to reduce total cholesterol and bad cholesterol or LDL and increases HDL cholesterol or good cholesterol. This salad tastes great. The macadamia and pine nuts creamy sauce is fantastic. You have to try it to believe it! 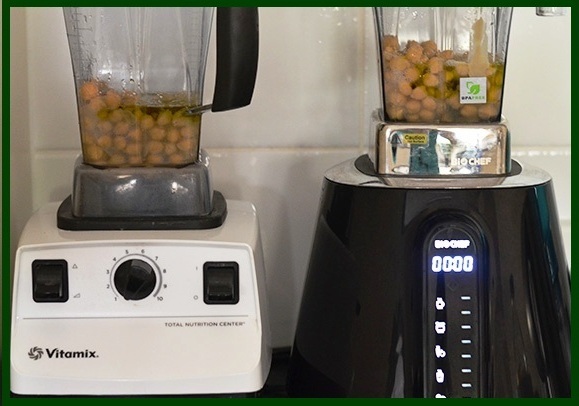 In a Vitamix or strong blender, blend all sauce ingredients until completely smooth. 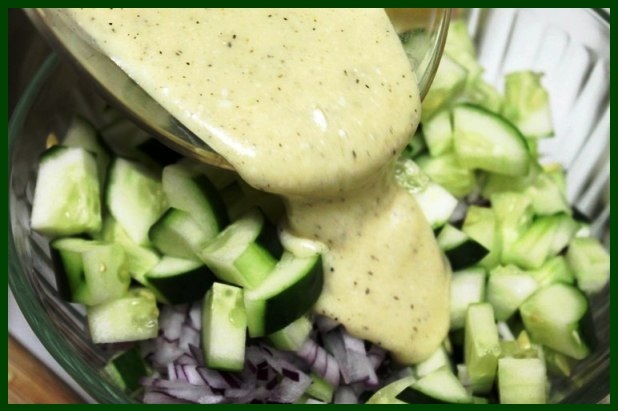 The sauce should be thick, because when you stir it into the salad, the water from the cucumber will make it more liquid. 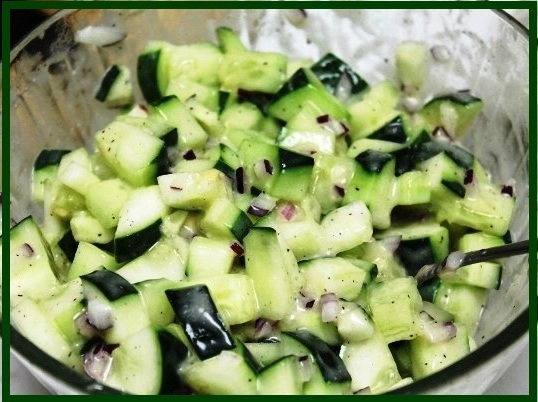 Place salad ingredients in a mixing bowl; pour creamy sauce over the cucumber, dill and onion. Stir so that everything is evenly coated.